Why only ugly sweaters? What about an ugly (I mean beautiful!) hat instead? It gets you in the right mood for Christmas or Thanksgiving. 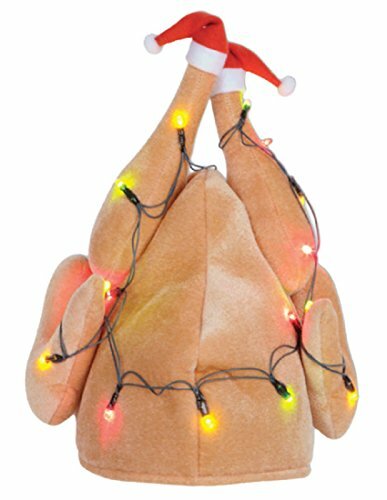 GET SILLY: Ditch the boring Santa hat this year for something a little more unique with this hilarious plush turkey hat. FESTIVE DECOR: For even more pizzazz, this hat lights up with battery powered string lights so you’re the life of the party. KISS THE COOK: This is the perfect festive replacement for your old chef hat. Let everyone know who’s in charge of the turkey this year. SUPER SOFT: This hat is made of smooth, soft plush material just like a fuzzy stuffed animal so it’s fun and cozy. PERFECT GAG: If you’re looking for the perfect gag for a secret Santa or your favorite cook, get this hat to liven up the party.